A favorite from my childhood, Pollo alla Cacciatore is a dish I don’t make frequently enough these days but which is also a favorite in our young family. Translated as hunter style chicken I am not sure where this dish originated from as just about every other recipe for pollo alla cacciatore uses plum tomatoes or tomato sauce, and this family version does not. Evidently every region, and even every family, has their own variation. I had never even heard of it having tomato until I once saw this on a restaurant menu. I tried it, and here is the version as we make it. Heat a wide pot on medium to medium-high heat (6-7 on my electric stove top). Brown the chicken in batches without overcrowding to prevent boiling (you know, when too much liquid builds up in the pot and the meat doesn’t brown but turns gray instead), adding salt and pepper to taste. Remove the browned chicken from the pot to make room for the next batch and keep at it until all the chicken has been browned. 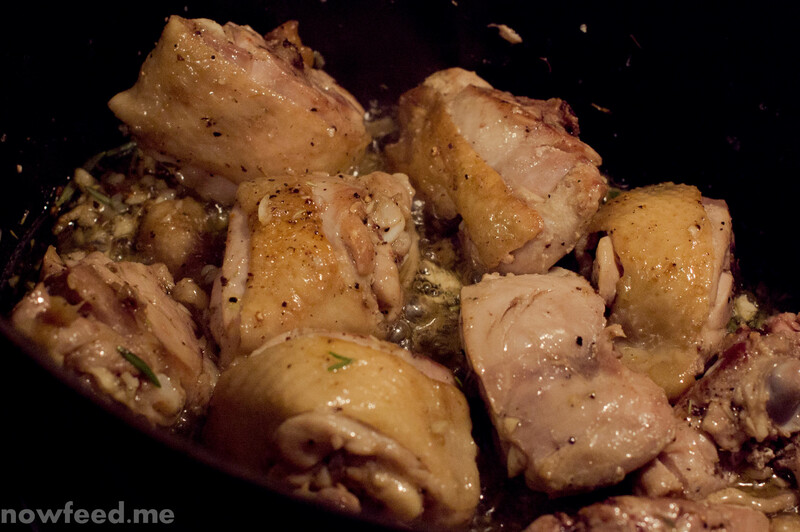 When done return all the chicken to the pot, reduce the heat a notch (6 on my stove), and add the garlic. 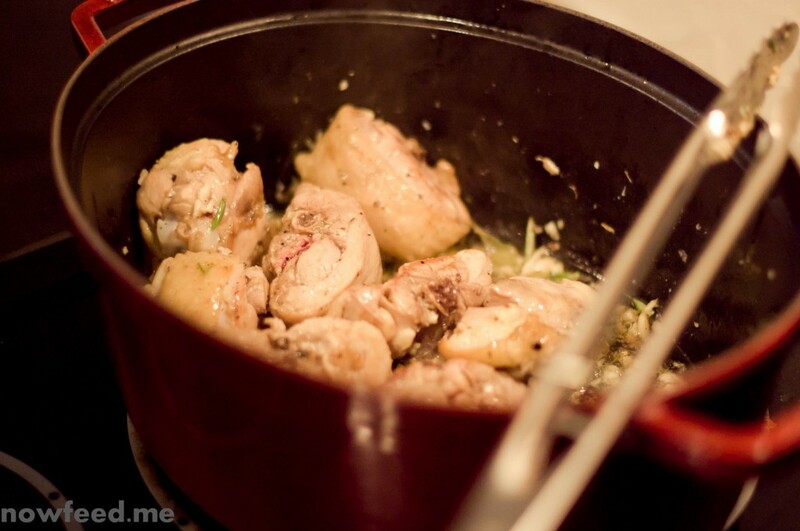 Quickly sweat the garlic to release the flavor stirring everything together to avoid burning. Add the sage, the rosemary, give it all a quick stir, then add the white wine and bring to a medium boil, and allow the wine to reduce by half. Add about 1/2 a cup of water and reduce to a simmer for about 30 minutes. Check on it periodically, adding a little more water if needed to prevent the liquid from cooking out completely. After about 30 minutes add the vinegar, adjust the salt and pepper if needed and cook for another 5 minutes. A few serving suggestions for this dish are wild rice, mashed potatoes, polenta, risotto, a pasta such as farfalle, or simply with a salad. A baguette or other crusty bread is also must to soak up the sauce. The amount of garlic in this dish can vary widely depending on your taste. I love garlic so I use a lot and mince it. If you are not keen on garlicky foods you can put less garlic and slice it instead of mincing it which will reduce the intensity of the flavor. If the heat is too high when you add the garlic and you find it turning brown, quickly add the white wine to stop the frying of the garlic. You don’t want it to burn as it will imbue a burnt flavor to the dish. (Mind you I’d still eat it but it won’t be the same). You can add the sage and rosemary right after. If you are not partial to vinegar you can omit it from the recipe. Indeed adding the vinegar is a new development as my mother never added it when I was living at home. It is something she introduced us too on one of her visits and we have continued to use it since as it adds an extra dimension to the dish. 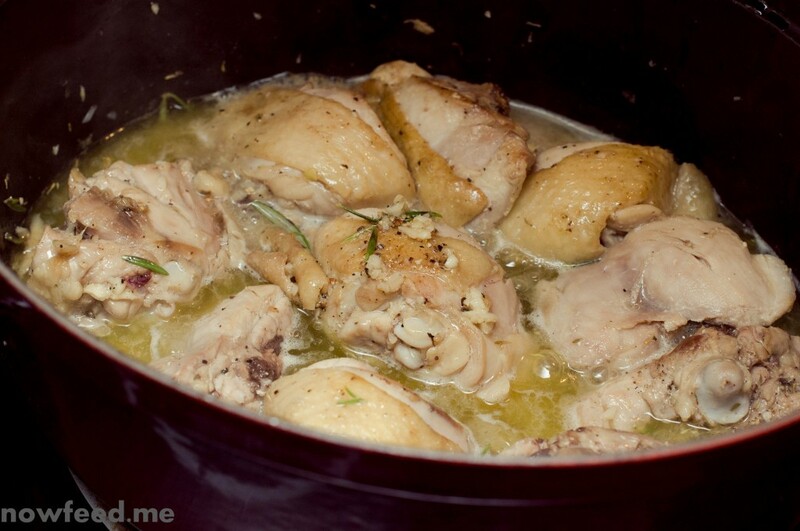 This entry was posted in Food, Recipes and tagged chicken, Italian. Bookmark the permalink.